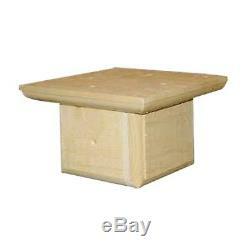 23320 Features: -Makes it easy to mount a feeder or nest box on a 4" x 4" post. Sustainably grown 1 eastern white pine provides for easy cleaning and durability. Color: Natural eastern white pine. Country of Manufacture: -United States. Dimensions: Overall Height - Top to Bottom: -5. Overall Width - Side to Side: -7.25. Overall Depth - Front to Back: -7.25. Overall Product Weight: -1 lbs. That's how we do it. We strive to get your order in your hands faster than anyone else! &###x1F31F;&###x1F31F;&###x1F31F;&###x1F31F;&##x1F31F. A pleasure to do business with! Boxes, APO or FPO addresses. We are not responsible for undeliverable or incorrect addresses. The item "Coveside Post Mount" is in sale since Sunday, July 17, 2016. This item is in the category "Home & Garden\Yard, Garden & Outdoor Living\Bird & Wildlife Accessories\Birdhouses". The seller is "mojogroup" and is located in United States. This item can be shipped to United States.